Learn the best places to stay in Osaka for tourists in this Where to Stay in Osaka guide. 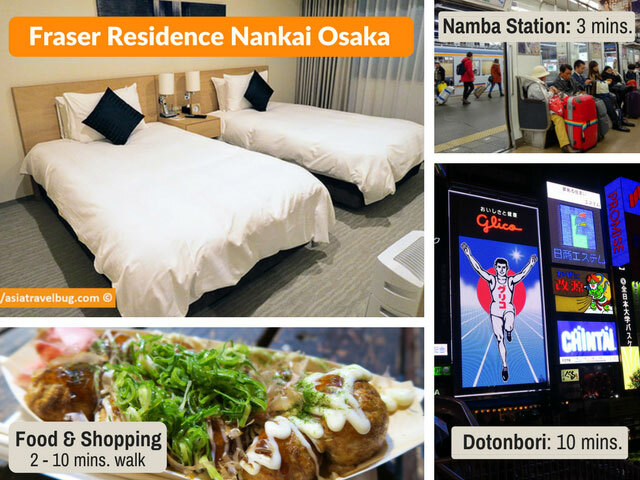 To help you decide, I’ve listed down the 4 best areas to stay in Osaka for hotels that are highly convenient for sightseeing based on my personal experience. The best places to stay in Osaka are Namba and Umeda. Other good places to stay in Osaka are hotels near the Midosuji subway line, Osaka Castle or Universal Studios. Namba and Umeda are major transport hubs with lots of shops and restaurants. Stay in Namba if you love food and nightlife. Stay in Umeda if your love modern cityscape. The Midosuji subway line connects Namba, Umeda and Shin-Osaka Shinkansen bullet train station, making the hotels near this subway line highly convenient for tourists. Osaka Castle Area is a great place to stay particularly during cherry blossoms season. My personal favorite is Fraser Residence Nankai Osaka which I consider as the best place to stay in Osaka from my personal experience. I highly recommend Fraser for its spacious rooms, reasonable price and its strategic location across Namba Nankai Station! Fraser is a very popular hotel in Osaka and rooms can be limited. Consider yourself very lucky if you’re able to get a room here! Book Fraser Nankai in Booking.com or Agoda before the rooms get sold out! Fraser Residence Nankai Osaka – Best hotel to stay in Namba Osaka for families and groups. The hotel sits on a fantastic location within short walking distance to Namba Station and Dotonbori. Rooms are spacious, equipped with a kitchenette, at a reasonable price. I love the hotel’s service and Japanese breakfast. Check rates in Booking.com or Agoda. 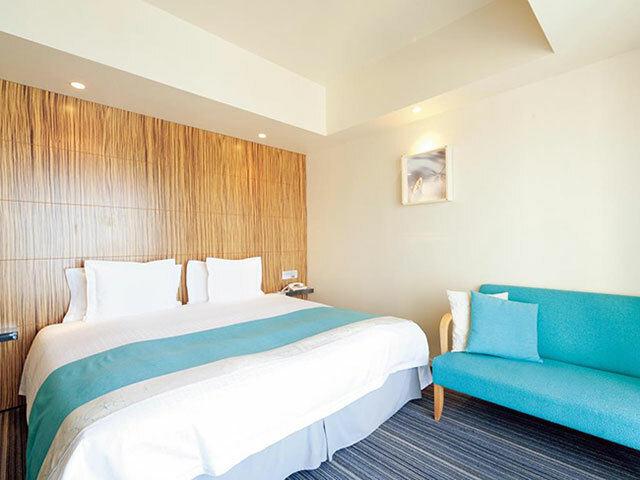 Holiday Inn Osaka Namba – Best for practical travelers. Having personally stayed here, I like the hotel’s highly strategic location right smack in Dotonbori, and its spacious superior twin rooms at a very affordable price. Affordable restaurants and shops are literally outside the hotel’s doorstep! I recommend this hotel for couples, group of adult travellers and avid shoppers. Check rates in Booking.com or Agoda. Courtyard by Marriott Shin-Osaka Station – Best for those who wish to be next to the shinkansen station for their bullet train ride. JR pass holders will be able to maximize their JR pass for easy day trips to Kyoto, Himeji and Kobe. Getting back to Tokyo is very easy and straightforward too via bullet train. 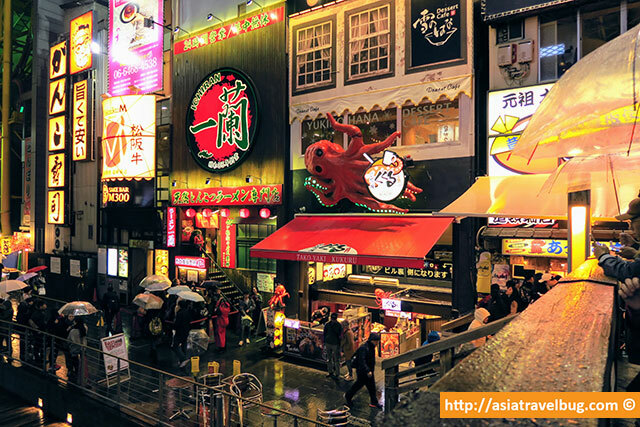 The lively Dotonbori is just a 20-minute direct subway ride away. Check rates in Agoda or Booking.com. Swissotel Nankai Osaka – Best place to stay in Namba for easy train and subway commute, while still being in short walking distance to Dotonbori. Getting to and from Kansai Airport is as easy as 1-2-3! Being right on top of Namba Nankai Station, travelers with elderly and children will definitely appreciate the location of Swissotel. I love the hotel’s sweeping views! Check rates in Booking.com or Agoda. Nono Namba Hotel – Best for families who wish to experience Japanese style accommodation in Namba with all the modern comforts. Fantastic location just across Dotonbori and 5-minute walk to Kuromon Market. Nothing beats the free ramen every night! This is the most memorable hotel in Osaka for me. Get a superior room for more space. Check rates in Agoda or Booking.com. Heading to Kyoto and Tokyo too? Check out Where to Stay in Kyoto and Where to Stay in Tokyo guides. Just like Tokyo, Osaka is well covered by subways and trains which can get you anywhere easily and efficiently. The red Midosuji subway line cuts across the city and is the most convenient line in Osaka for tourists as it connects Namba downtown, Umeda downtown and Shin-Osaka Shinkansen bullet train station. In case you are unable to get a hotel near the Midosuji subway line, just pick a hotel that is within 5-minutes walking distance to a subway or train station within the central area of Osaka, which is bounded by the circular JR Osaka Loop line. Where is the Best Place to Stay in Osaka: Namba or Umeda? Well, the answer actually depends on your itinerary and how you imagine your Osaka vacation to be. 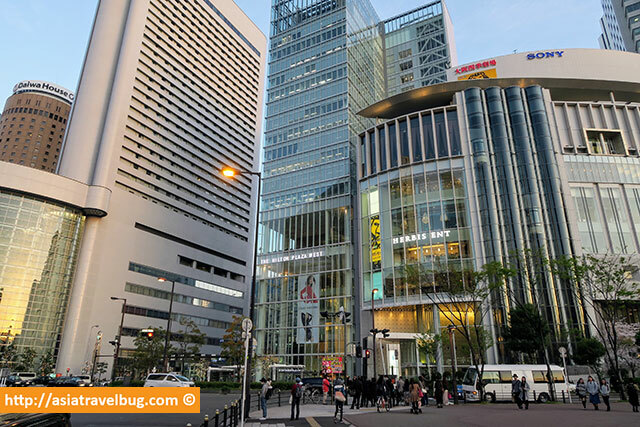 Namba – Namba and its immediate surrounding areas Dotonbori, Shinsaibashi and Nippombashi, are the best areas to stay in Osaka if your itinerary mainly revolves around Osaka’s Dotonbori Area, Nara and Kyoto. 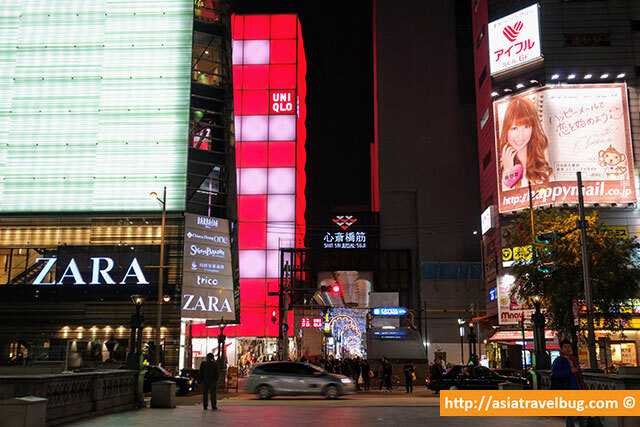 If your itinerary is mostly into food trip, shopping and nightlife, then Namba is the place to be. I personally prefer to stay in Namba and its immediate surrounding areas since I go to Osaka primarily for food and shopping. Umeda – Although Namba is livelier, Umeda is the most well-connected major transportation hub in Osaka. If Namba will require you some train/subway transfers to get to most major sights in the Kansai region, Umeda provides direct train/subway access to major sites in Kansai from Kyoto, Nara, Kobe up to Himeji. Shin-Osaka Station, where the shinkansen bullet train stop is located, is just one station away from Umeda’s Osaka Station perfect for those with JR Pass. Based on my personal experience in my past 3 trips to Osaka, I can say that the best place to stay in Osaka is Namba since it is highly convenient for food, shopping and public transportation. Other recommended areas to stay in Osaka are Umeda, Osaka Castle and Universal Studios depending on your itinerary. In my personal opinion, Namba is the best place to stay in Osaka since great food and reasonably priced shops are all within walking distance and it exudes a Japanese vibe! I have personally based myself in Namba 2 times out of my 3 past trips in Kansai region and consider this as my favorite area to stay in Osaka. Namba is bustling day until night, making it possible for late night food trips and late night shopping. This makes Namba the best area to stay in Osaka and a very practical place to be for people who want to make the most out of their limited vacation time. Apart from convenience for food and shopping, Namba is also very well connected by subways and trains making it a good base to get to anywhere in Osaka, Kyoto, Nara and even to Kansai airport. If your trip mainly revolves around Dotonbori in Osaka for food adventure with day trips to Kyoto and Nara, then I suggest Namba to be your base. Great local Japanese atmosphere. Bustling nightlife especially in Dotonbori with neon lights as you see on TV. Easy access to reasonably priced restaurants and shops. Restaurants close very late at night and bargain store chains open 24/7. Good variety of mid-range (3*) and upper class (4*) hotels around the area with bigger room size compared to Japanese standards. Convenient for sightseeing in Osaka and for nearby day trips via subways and trains. Convenient for day trips to Downtown Kyoto. Gion Shijo or Kawaramachi Station in Downtown Kyoto is just 1 hour train ride away from Namba with 1 transfer. Direct access for day trips to Nara in 40 minutes via Kintetsu Nara railway line. Direct access to airport via train from Namba Nankai Station (40 minutes) or airport bus from Namba OCAT (50 minutes). Direct access to Shin-Osaka Shinkansen Bullet Train Station via Midosuji subway line in 15 minutes from Namba Station. So Where Exactly is Namba? Namba is the major transportation hub within the Minami (South) commercial district and is one the 2 downtown centers in Osaka, the other one being Umeda. For tourists, Namba Downtown can be loosely referred as the area covering the following sub districts which are all within 5 to 15 minutes walk from each other. 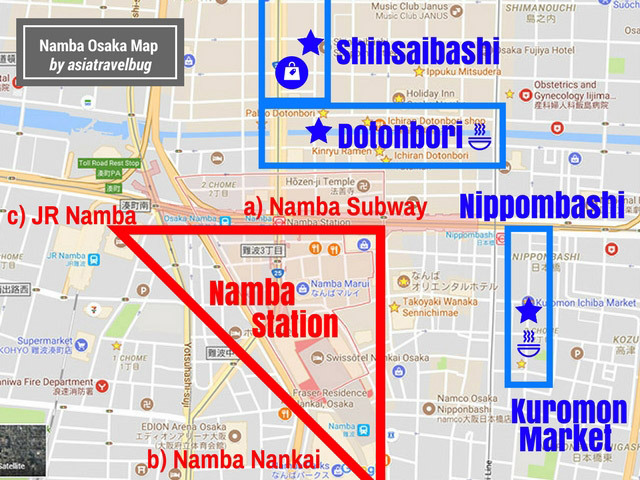 In this blog post, I will describe each of these sub districts in detail so you can decide the best place to stay in Osaka’s Namba area for your trip. Staying within the immediate surrounding of Namba Station is the best place to stay in Osaka for easy access to Kansai Airport right in the heart of downtown. After a tiring flight, there’s no better way to start your Osaka vacation by checking into a downtown hotel that is easy to get to from the airport. Let the futuristic-looking Nankai Airport Limited Express Rapit train take you direct from Kansai Airport to Namba Nankai Station comfortably in just 40 minutes! Namba Station is actually not a single railway hub. It is comprised of multiple interconnected subway and train lines which are between 5 to 15 minutes walk from each other. Namba Nankai Station – This station is useful for airport transfers to either Kansai Airport (via train) or Itami Airport (via bus). Namba Station Subway Line – There are multiple subway lines that converge here. The most important is the Midosuji subway line that connects Namba to Umeda and Shin-Osaka. Midosuji subway line is just 5 minutes walk north of Namba Nankai Station. Also, you can take the other lines here to get to other tourist sites such as Nara or Universal Studios. Subways are quite extensive in Osaka and tourists will mostly use the subway lines to get around the city. JR Namba Station – You can find JR Namba Station 10 – 15 minutes walk east from Namba Station subway lines. Although the area is a bit off from the main happening area in Namba, it is just 15 minute walking distance to Dotonbori and you can find more affordable accommodations here. Even if JR Namba Station is not particularly useful for tourists, it is right beside Namba OCAT airport limousine bus hub which makes it easy to get to and from Kansai Airport or Itami Airport. 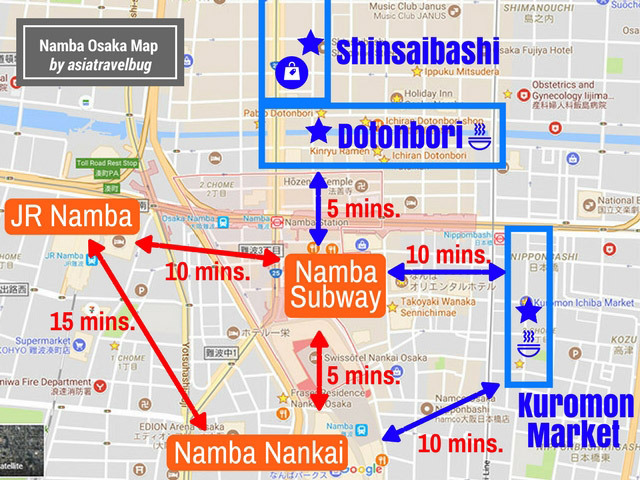 For better convenience, I highly recommend hotels that are within 5 minutes walking distance to either Namba Nankai Station or Namba Station Subway Line for tourists. Below are my recommended hotels which are within easy 3 to 5 minutes walk from these 2 stations in Namba. Fraser Residence Nankai Osaka (4*) – I have personally stayed at this hotel and can highly recommend Fraser Residence for its strategic location, generously sized rooms and reasonable rates. I personally think that Fraser offers the best accommodation in Osaka for family. It’s a very popular hotel and is frequently fully booked. So if you’re interested in staying here be sure to reserve your room at least 3 months in advance. All rooms come with a kitchenette and washing machine giving guests flexibility, making this the best place to stay in Osaka for families, for longer stays or for those with dietary restrictions. Since all Studio rooms have been booked out, I stayed in a 1 Bedroom Apartment and loved its generous room size of 40 sqm. The staff were attentive, knowledgeable, and polite, and they even went so far as emailing me directions to their hotel from Namba Nankai Station a few days prior to my arrival, without me asking. The station, by the way, is just a 3-minute walk from the hotel so it’s in a very convenient location. The hotel’s daily breakfast is good, though I would recommend getting it from their restaurant partner in Namba Nankai Station where the Japanese breakfast was really tasty with generous portions. Nightly rates start at a reasonable USD 150 for the Studio (28 sqm), USD 220 for the 1 Bedroom Apartment (40 sqm), and USD 475 for the 2 Bedroom (77 sqm). Book your room today in Agoda or Booking.com before it’s gone! Swissotel Nankai Osaka (4.5*) – If Fraser is fully booked, the nearby Swissotel Nankai Osaka Hotel is an excellent alternative. 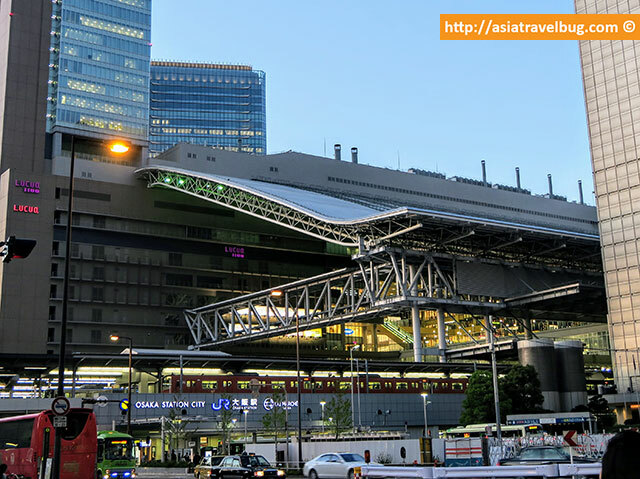 I think this hotel is best for first timers in Osaka as it is located right on top of the Namba Nankai Station, making train airport transfers to and from Kansai Airport a breeze! I have personally stayed in this hotel during my very first trip to Japan years ago and can highly recommend it for its location and for its sweeping views. The busy lobby can be unsettling but the good room sizes, great views, and very good location more than make up for this. I recommend the 32 sqm Swiss Advantage Twin rooms which come recently renovated and start at USD 225 per night. Although a bit pricey, I think the hotel’s highly strategic location well justifies its price. Hotel Ichiei (3*) – If you’re looking for a hotel with a Japanese flair, Hotel Ichiei is the perfect choice in Namba downtown! This hotel is directly connected to Namba Station Midosuji Subway Line making it highly convenient for tourists to get around. For those coming from Itami Airport, the airport limousine bus stops right at the front of the hotel. The Japanese styling sets this Hotel Ichiei apart from others that focus more on a Western ambiance. 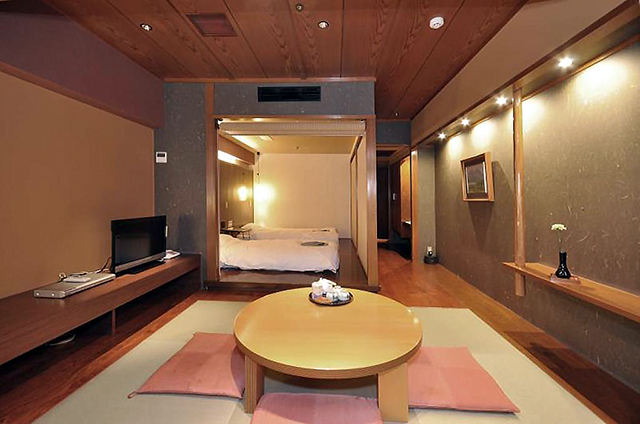 Both traditional Japanese rooms with futon beds and western rooms are available at this hotel. I recommend the Modern Japanese Style room which combines western beds with Japanese style tatami floors. This room is generously sized at 36 sqm and nightly rates start at an affordable USD 150. For groups or families, you can choose one of the biggest rooms in Namba – the Suite can sleep 4 and is a massive 66 sqm, with nightly rates from USD 270. 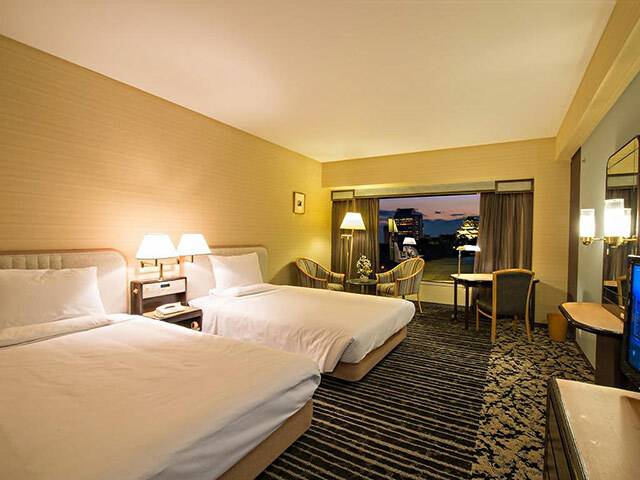 Namba Oriental Hotel (3*) – Even if the facilities of Namba Oriental are seen by some guests as somewhat old, the prime location and reasonable rates make up for it making it a great choice in Namba for budget travelers. This hotel is centrally located within Namba with lots of restaurants and shops right at your doorstep. Also, Namba Subway Station, Namba Nankai Station, Dotonbori and Kuromon Market are all within 5 minutes walk, making the hotel’s central location highly convenient for tourists. Nightly rates for the 23 sqm Superior Twin start from USD 135. For more space, the 32 sqm Deluxe Triple is recommended for groups of 3 or 4 and is priced starting from USD 175 and USD 190 per night respectively. 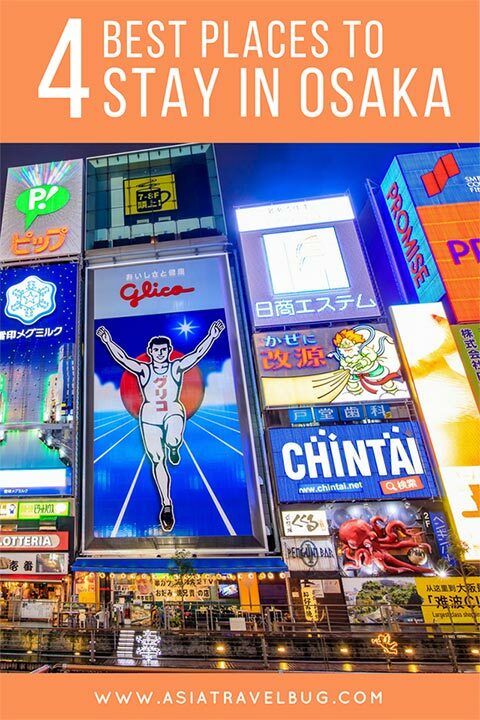 Just less than 10 minutes walk away from Namba Station is the lively and colorful Dotonbori, which I consider as the best area to stay in Osaka if you are into nightlife, food and shopping! 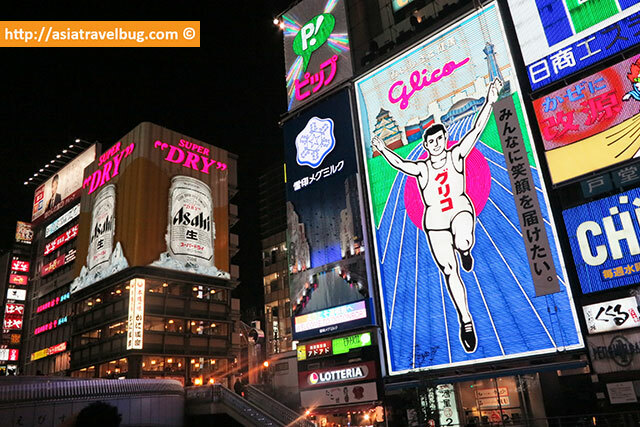 Dotonbori is where you will see the famous Glico man, the giant crab sign and neon lights which all symbolize Osaka as you see on TV and in social media. Even if Dotonbori can be loud at night, it is a practical place to be in as you will be right in the pulsating heart of Osaka’s entertainment and food scene which runs until very late at night. 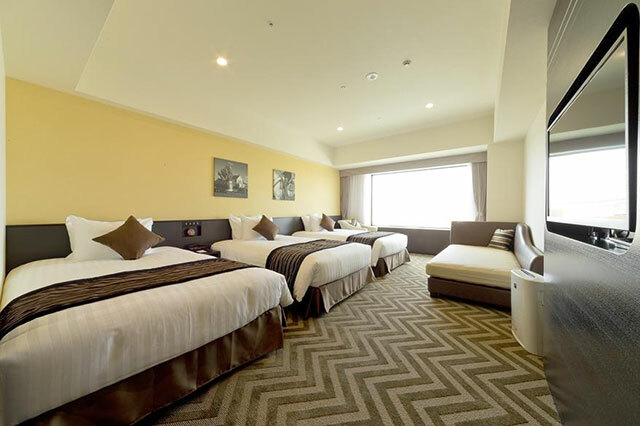 Holiday Inn Osaka Namba (3.5*) – If Fraser Nankai Osaka is fully booked, Holiday Inn Osaka Namba would be my next choice as the best place to stay in Osaka. This hotel is located in an unbeatable location at the heart of Dotonbori surrounded by endless restaurant choices. 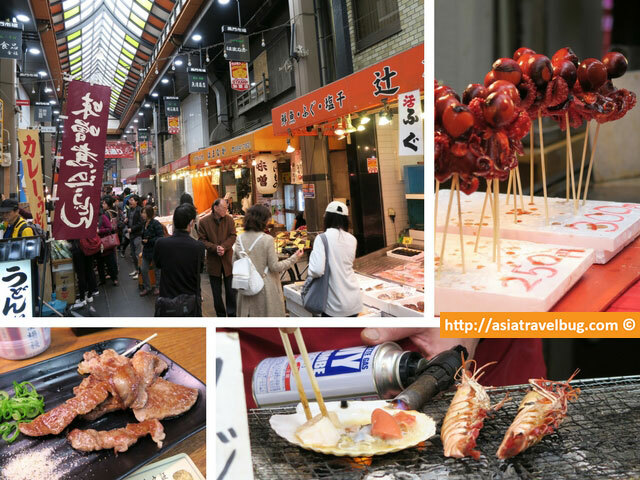 If the food in Dotonbori is not enough, you can easily continue your food adventure to Kuromon Market which is just less than 10 minutes walk away. Nightly rates are very affordable starting at USD 135 for twin and USD 175 for triple. Both twin and triple rooms are 25 sqm in size. 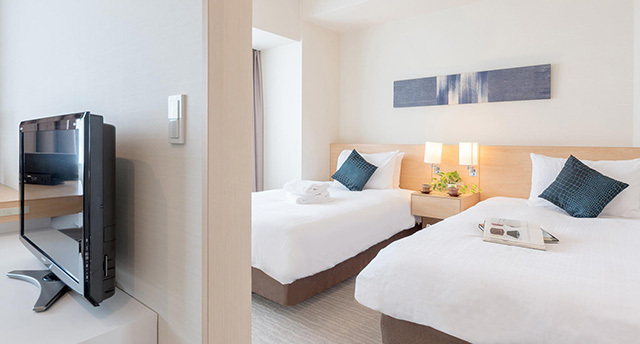 Cross Hotel (3.5*) – This hotel is in a fantastic location at the intersection of the beautiful Midosuji Avenue and Dotonbori, and just a 5-minute walk to Namba Station Midosuji Line. Staff here are polite, friendly and helpful. Twin and triple rooms are both 27 sqm and nightly rates are from USD 180 and USD 225 respectively. 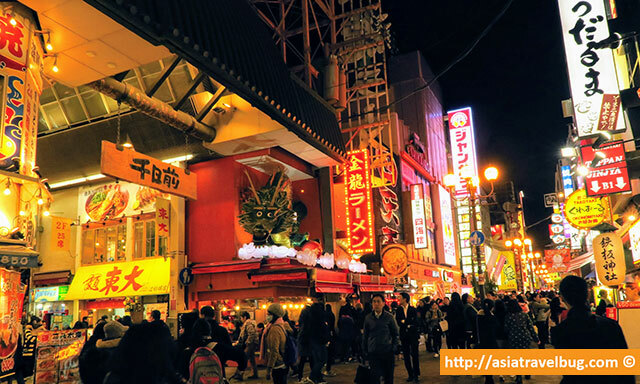 Located at the eastern edge of Dotonbori is Nippombashi where you can find the famous Kuromon Ichiba Market. Nippombashi is the best place to stay in Osaka for the ultimate foodie as both Dotonbori and Kuromon Market are just a stone throw’s away. Though not as famous as Tsukiji Market in Tokyo or Nishiki Market in Kyoto, Kuromon Market has risen in popularity in the recent years. The place is now bustling with tourists during daytime. I particularly enjoyed the grilled seafoods (although a bit pricey), the fresh seasonal fruits and the cheap bento box takeaways. Even if you are staying somewhere else, this place is not to be missed! Nono Namba Hotel (3*) – For a unique Japanese experience close to a modern version ryokan (Japanese Style Inn), stay at the Nono Namba Hotel. Part of the Dormy Inn chain, this is a modern Japanese style boutique hotel complete with tatami mats, free access to a communal onsen bath, and free ramen nights from 9pm to 11pm. As Japanese as it sounds, you need to place your shoes in lockers provided by the hotel before entering, so don’t forget your socks! Considering the prime location and other perks included, I find the price of Nono Namba Hotel to be one of the cheapest of its category in Namba Downtown, with affordable nightly rates starting at USD 120 for a 24-sqm Superior Room good for two and USD 180 for a 31-sqm Deluxe Room good for a family of four with small children. The price of this newly opened hotel is definitely a steal and is quite unbelievable, no wonder they’re always fully booked. Book in Agoda before it’s gone! Right above the western part of Dotonbori, you can find the main shopping area of Shinsaibashi. The 2 main shopping strips in Shinsaibashi run parallel to each other which are Midosuji avenue and Shinsaibashi Shopping Arcade. Midosuji avenue is dotted by luxury stores while Shinsaibashi Shopping Arcade houses more mainstream affordable shops like Uniqlo and H&M. This makes Shinsaibashi one of the best areas to stay in Osaka for tourists whose ultimate goal is to shop until they drop! Hotel Nikko Osaka (4*) – If you love shopping, stay at the Hotel Nikko Osaka! Ideally located in the swanky Midosuji Avenue area, the hotel is steps from luxury shops and the Shimbashi Shopping Arcade. And with Shinsaibashi Subway Station directly connected to the hotel, it is easy to quickly get to other parts of the city for sightseeing. Standard Twin rooms, sized at 24 sqm, start at nightly rate of USD 175. Read on the rest of this post if you are looking for alternative areas on where to stay in Osaka beyond Namba. Learn why Umeda, Osaka Castle Area and Universal Studios Japan (Osaka Bay Area) can be a great choice for you. In case you are also heading to Tokyo or Kyoto, don’t forget to check out Asiatravelbug’s Where to Stay in Tokyo and Where to Stay in Kyoto guides. Umeda is the main business district in Osaka with towering modern skyscrapers and a good variety of department stores. Just like Namba, you will never run out of food and shopping choices in Umeda. Although Umeda lacks the local Osakan Japanese vibe offered by Namba, it offers better, easier and more direct intercity travel within Kansai region. Umeda is served by 2 adjoining major stations Umeda Station and Osaka Station, making it easy to get to anywhere in Osaka or nearby cities via train or subway often without the need for any transfers. If you love modern cityscape and if your itinerary covers a lot of day trips to different cities in Kansai region, beyond Kyoto and Nara, then Umeda is the best place to be in Osaka. Highly convenient for day trips to nearby cities in Kansai with direct train to Himeji, Kobe, Kyoto and Nara. Very close to Shin-Osaka Shinkansen Station via Midosuji subway line which is just 6 minutes ride away. Convenient direct train access to Kyoto. Downtown Kawaramachi and Arashiyama in Kyoto are just a little less than 1 hour away from Umeda via direct Hankyu railway. Convenient for sightseeing in Osaka. Osaka Castle and Namba are within 10 minutes direct train or subway ride away. Easy access to reasonably priced restaurants and shops. Good variety of luxury and upper mid-range tourist hotels around the area with bigger room size compared to Japanese standards. Convenient 1-hour direct access to airport via JR Kansai Rapid Airport train from Osaka Station or via Kansai airport limousine bus. Sights Nearby: Umeda Sky Building, Hep 5 Ferris Wheel. 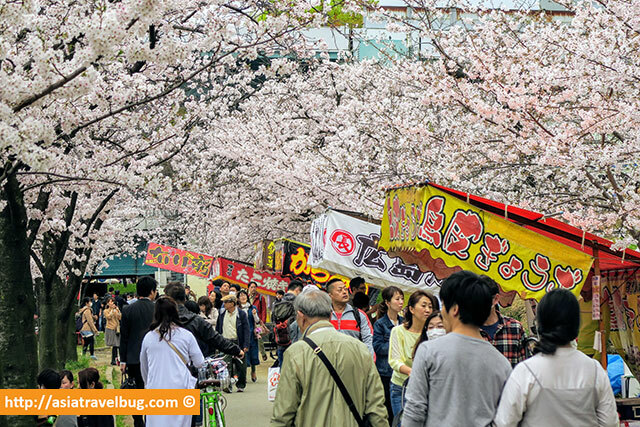 5 minutes train away from Sakuranomiya Park for cherry blossoms. 10 minutes train away from Osaka Castle. 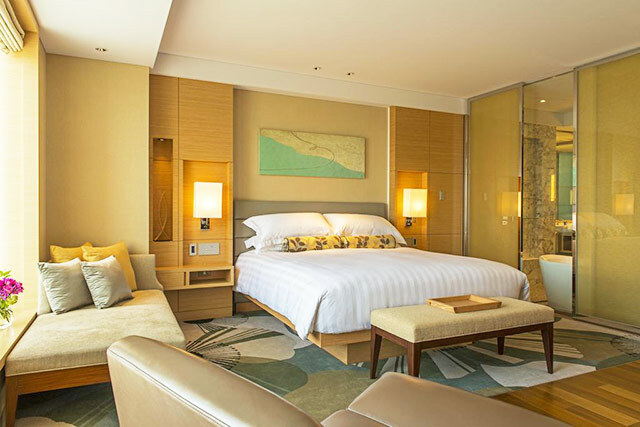 Intercontinental Hotel Osaka (5*) – One of best things about the Intercontinental are the generously sized guest rooms with amazing views! The location is also very good, being 5 minutes walk from JR Osaka Train Station and set in an area with many restaurants and shops. The large rooms are modern, bright and luxurious. The Superior Room comes at a very generous 41 sqm, and nightly rates are from USD 260 which is reasonable for a hotel of this caliber! This is a great value luxury hotel in Japan, considering that similar luxury hotels in Kyoto and Tokyo are much more expensive starting at USD 260 and USD 310 per night respectively during regular season. Hotel Hankyu International(4.5*) – Most of the guest rooms in Hotel Hankyu International (not to be confused with Hotel New Hankyu Osaka) are generously sized while being priced very affordably. The Superior Twin room measures 42 sqm and costs just a fraction of the price for a similar room at the Intercontinental – nightly rates are from just USD 160 here! This hotel also boasts wonderful views from all guest rooms, which are purposely situated on the 26th floor or higher, giving guests vistas over Osaka. Also, the hotel is serviced by the Airport Limousine Bus, making it simple to get to and from Kansai Airport. 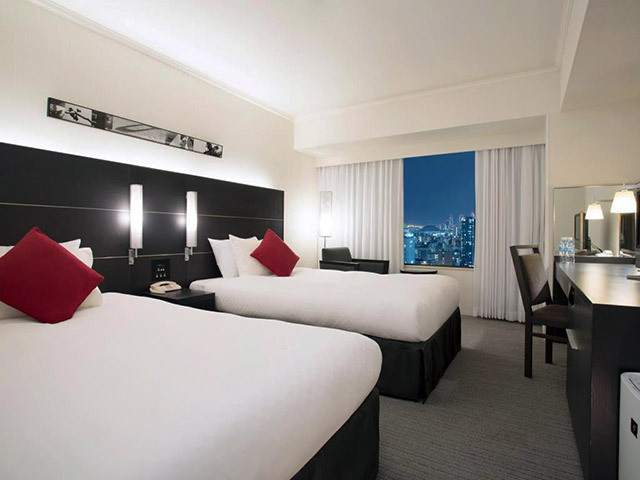 Hilton Osaka (4*) – The Hilton Osaka is in a great location in Umeda, just under 5 minutes walk from Osaka Station. 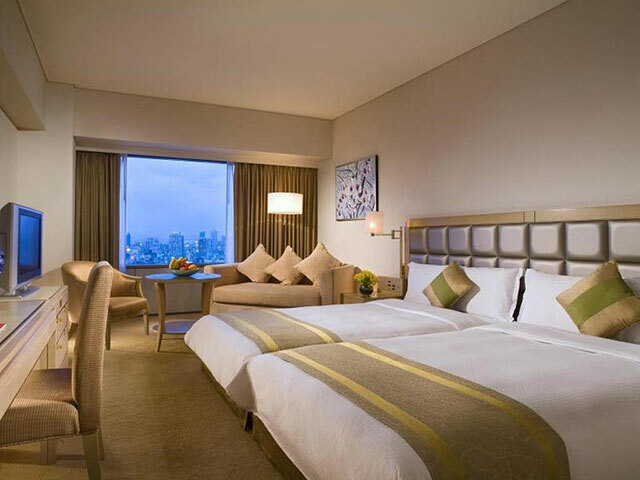 Rooms are attractively furnished and decorated with Japanese influences, and there are lovely city views from many rooms especially on the higher floors. The hotel is serviced by the Airport Limousine Bus from Kansai Airport. For bus to Itami Airport or higher frequency airport bus transfers to Kansai Airport, the Herbis Osaka bus stop is just one block away. A Twin Room is sized at 30 sqm and rates here are from USD 195 per night. I discovered Osaka Castle Area by chance as a place to stay when I made a last minute decision to fly to Osaka for cherry blossoms. This area is known for the iconic Osaka Castle but not really as a place where tourists will primarily base their stay since nightlife, shopping and food choices are relatively lacking compared to Namba Downtown and Umeda Downtown. 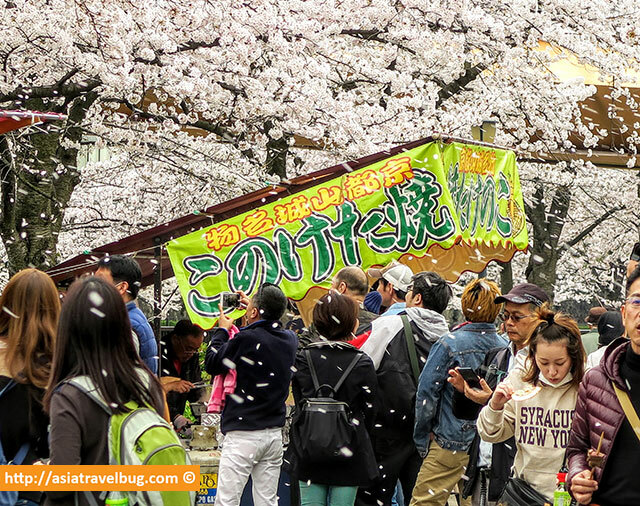 However, after staying here during the peak cherry blossoms season, all I can say is WOW – the area totally turned to a magical place from day until night surrounded by countless beautiful cherry blossom trees! Sakuranomiya Park which is located north of Osaka Castle, has a huge concentration of 5,000 cherry blossom trees by the lovely river bank, which is the most massive concentration of cherry blossom trees I’ve seen so far right within a major Japanese city. It totally blew me away! And if Sakuranomiya Park is not enough, you can continue to enjoy the cherry blossoms in Osaka Castle and in the nearby Kyoto. Particularly during cherry blossoms season which usually happens during the first half of April, the Osaka Castle Area is very lively with lots of people having picnic under cherry blossom trees. Some parts of the area have seasonal food stalls too! As a repeat traveler to Osaka, I personally think that the Osaka Castle Area is the best place to stay in Osaka during cherry blossoms season. You need bigger room space at a cheaper price compared to downtown even during non cherry blossoms season, and you don’t really mind about the location. Highly convenient for cherry blossom hanami and night time illumination. 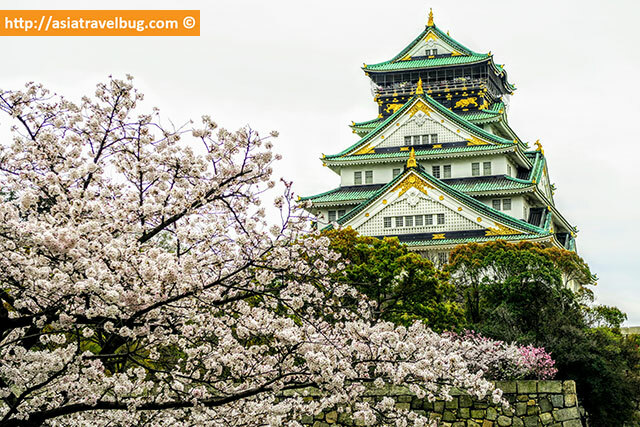 The best areas to enjoy cherry blossoms in Osaka are Sakuranomiya Park and Osaka Castle which are located in the general Osaka Castle Area. Convenient direct train access to Kyoto Downtown. Gion Shijo (Higashiyama) in Kyoto is just a little less than 1 hour train away from Kyobashi Station. Easy Access to Osaka Station in Umeda using the JR Osaka Loop Line. Bigger and cheaper hotel rooms. Since the area is off the beaten, hotels tend to be cheaper and with larger rooms compared to downtown. 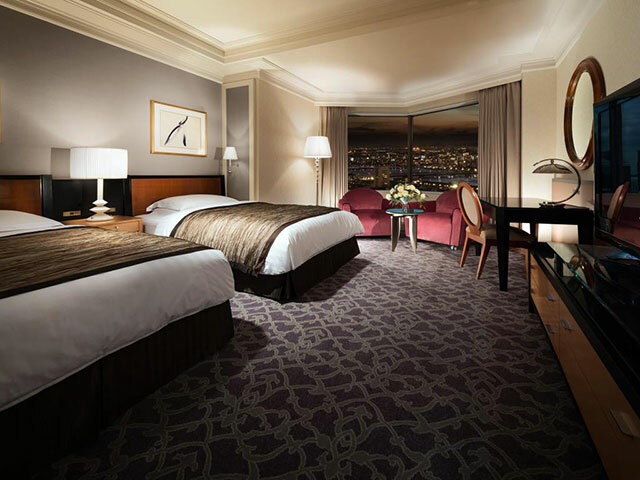 Imperial Hotel Osaka (4.5*) – Having personally stayed in this hotel, I highly recommend Imperial Hotel Osaka for tourists wishing to experience the beauty of the cherry blossom season in Osaka. Set right by river and Sakuranomiya Park, the setting is especially magical when the cherry blossoms are in bloom, illuminating the park in front of the hotel with spectacular colors from day until night. I loved having the time to enjoy hanami picnics under a cherry blossom tree in the park, but I could enjoy the views at any time from my room! The hotel itself feels luxurious and the bath amenities provided are fantastic! Although the hotel is a little secluded, the free regular shuttle to Osaka Station in Umeda more than makes up for this. I strongly suggest that you book a Superior River View Room so your room can face the river and the Sakuranomiya cherry blossom park. During regular season, these generously sized 40 sqm rooms have nightly rates from just USD 150, and a relatively fair price starting from USD 270 per night during peak cherry blossoms. Compare this to similar class hotels in Namba which can charge a hefty price tag from USD 400 per night upwards for the same peak travel period. Lastly, in case you will stay at this hotel and have a late flight, I highly recommend you to sign-up for the Imperial Club membership card ahead of your stay in order to get complimentary late check-out until 6pm. 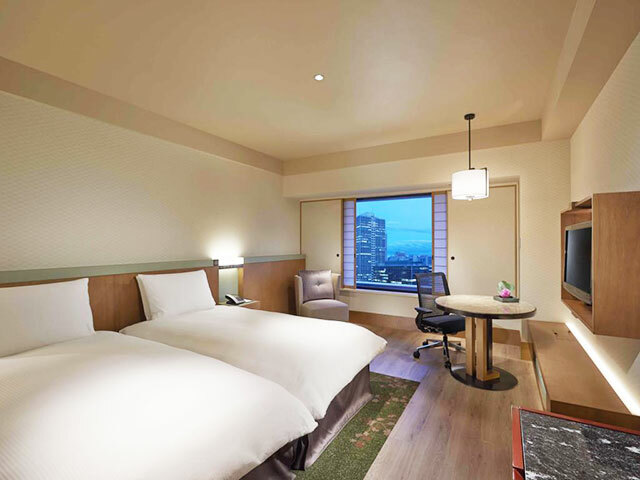 New Hotel Otani Osaka (4*) – Although the hotel is older, the hotel is just a short walk to the Osaka Castle for sightseeing and is ideally placed for enjoying cherry blossom season and hanami at the castle. I recommend either the Castle View Twin Room (30 sqm) or Castle View Junior Suite which represents excellent value for money with nightly rates starting at just USD 200 and USD 250 respectively. Outside cherry blossom season, these rooms are very affordable starting at just USD 120 and USD 200 per night. 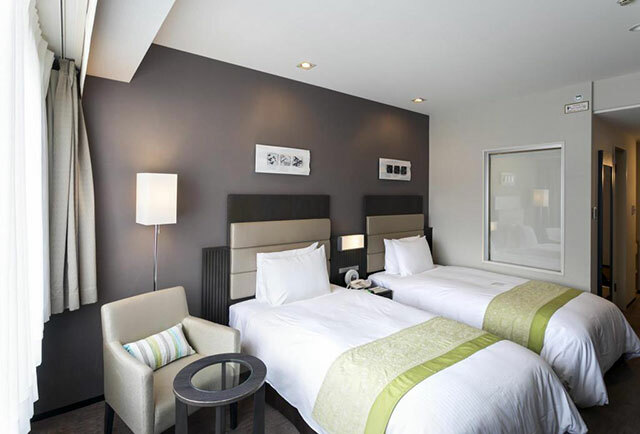 Hotel Monterey La Soeur Osaka (3.5*) – This hotel is a practical and affordable option for tourists who want to be in the Osaka Castle Area and near Kyobashi Station. The location of this hotel makes a great central base for cherry blossom viewing. 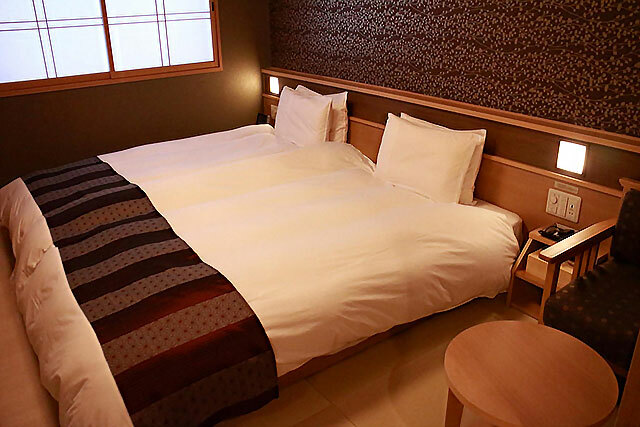 It is within walking distance of Sakuranomiya Park, Osaka Castle, and Kyobashi Station, from which you can take a train directly to Kyoto’s Gion Shijo (Higashiyama). Guest rooms are decorated in an art-deco style and offer nice views. Twin rooms are 22 sqm with fair nightly rates starting from USD 120 during regular season and USD 230 during the peak cherry blossom period. 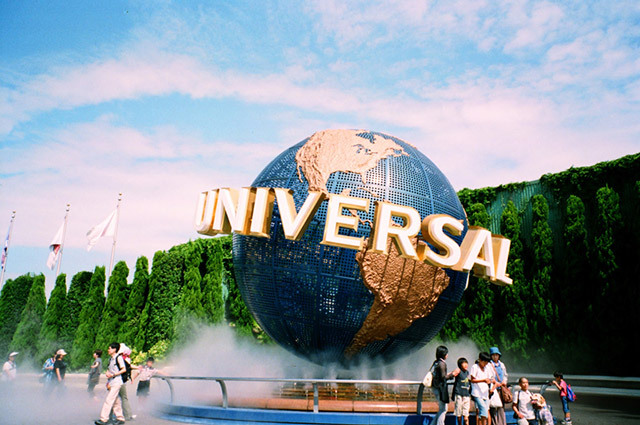 If you are traveling with kids and love theme parks, the Official Hotels within Universal Studios Japan (USJ) maybe the best area to stay in Osaka for family. If USJ is not enough, Osaka Aquarium is just a short ferry ride away! Very close walking distance to Universal Studios Japan. Universal Studios Japan tickets can be purchased from the hotel. Convenient access to Namba in 20 minutes with just 1 train transfer. Convenient airport transfer via airport bus from Kansai Airport or Itami Airport. Bigger and cheaper hotel rooms. 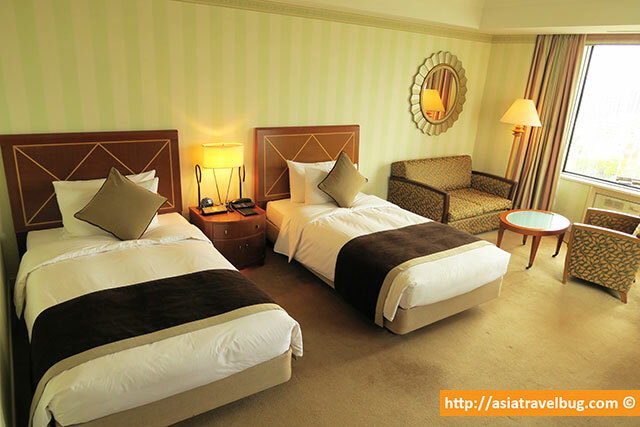 Since the area is not in Downtown, hotels tend to be cheaper and with larger rooms compared to Japanese standards. Sights Nearby: Universal Studios Japan, Osaka Aquarium Kaiyukan, Tempozan Ferris Wheel. The Park Front at Universal Studios (4*) – Located just 1-minute walk from the theme park gates, this official Universal Studios Japan hotel is perfect for families visiting the theme park. This newer hotel is modern and has a youthful vibe. Room sizes are good and one child under 6 stays free in existing beds. Standard Rooms are available as twin (at 30 sqm), triple or quad (both at 40 sqm) starting at nightly rates of USD 140, USD 170, and USD 230 respectively. 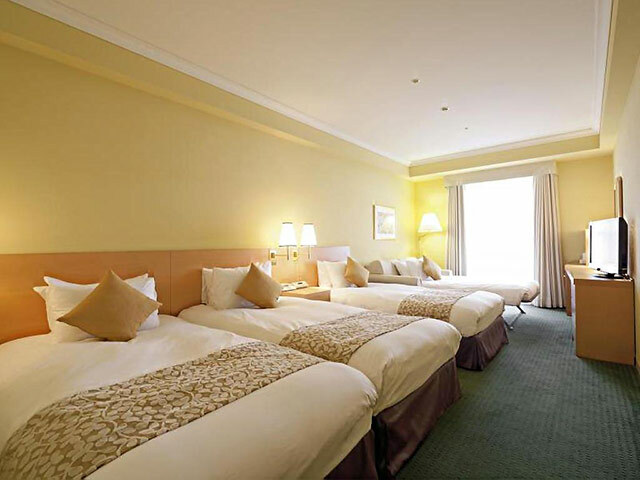 Hotel Universal Port (4*) – Situated just a 4-minute walk from Universal Studios Japan, this hotel is designed for families. There are good sized rooms that can sleep up to 4 guests, and in this hotel, all children under 6 stay free when sleeping in existing beds. Kids will love the themed decorations around the hotel! Choose from a twin, triple or quad room, at 28 sqm, 34 sqm, and 40 sqm respectively, with rates starting from USD 120 for a standard twin, USD 145 for a superior triple, and USD 165 for a deluxe quad. Expect to pay at least 50% more for hotels if you will be in Osaka during cherry blossoms season (typically during the first 2 weeks of April) or autumn foliage season (typically during the last 2 weeks of November). Accommodations in Osaka can get fully sold out far in advance for peak season travel. It’s best to book Osaka hotels at least 3 to 4 months ahead. Just like anywhere in Japan, expect to pay 30% more on Saturday night stays compared to weekday stays due to surge in local tourism. Where to Stay: Osaka or Kyoto? 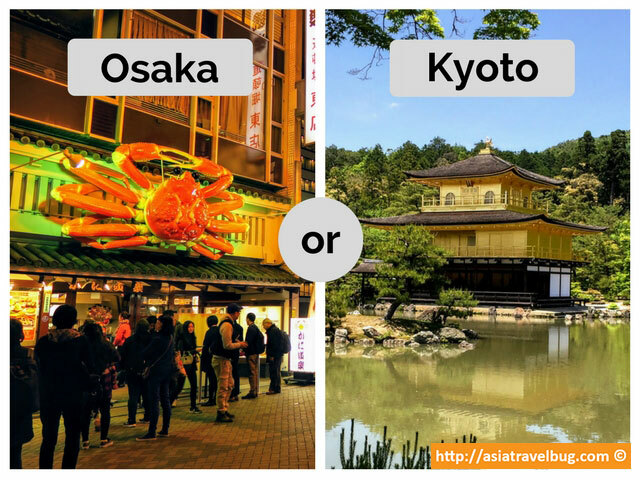 Many tourists are torn on where to stay – Osaka or Kyoto? 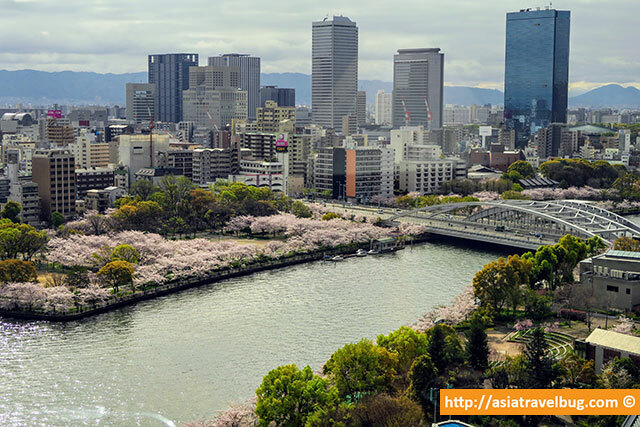 Here are some reasons why you should consider to stay in Osaka. While staying in Kyoto provides you a more authentic Japanese experience, Osaka offers more variety of food, shopping, nightlife, theme parks and, kid’s activities. Stay in Osaka if you want better variety and better quality hotels in strategic location, at a more affordable price than Kyoto. There are plenty of affordably priced downtown hotels in Namba and Umeda in Osaka. Also, if you plan to do day trips to a number of different places in Kansai region from Himeji, Kobe and Nara, Osaka is a better central base to stay. Stay in Osaka or Kyoto? Picking whether to stay in Osaka or Kyoto as base will boil down on your own personal preference, your itinerary, your budget and availability of hotels. Alternatively, if you don’t mind switching hotels and if you’re staying for a least 5 nights in Kansai region, you can always split your stay between Osaka and Kyoto to get the best of both worlds! Check out Asiatravelbug’s Where to Stay in Kyoto guide to learn the best places to stay in Kyoto. If you have any suggestions or questions on where to stay in Osaka, please feel free to leave your comments in this blog. Planning to Stay in Tokyo or Kyoto? Check out Asiatravelbug’s Where to Stay in Tokyo and Where to Stay in Kyoto guides. 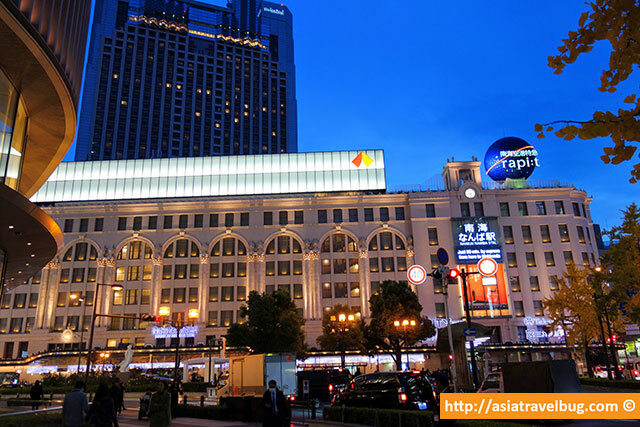 Have you picked the hotel where you will stay in Osaka? 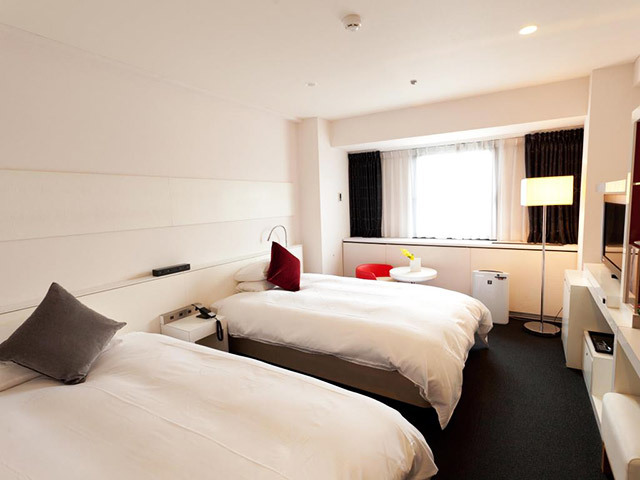 Asiatravelbug recommends Agoda for best hotel rates in Osaka. Need more time to decide where to stay in Osaka? 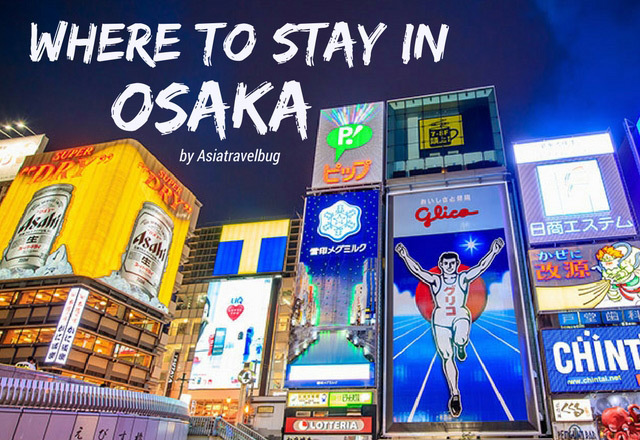 Bookmark this Where to Stay in Osaka guide or Pin below image for later reading! Need help from your travel buddies to decide where to stay in Osaka? Share this article with them using the social share buttons below! I have a question to ask regarding Osaka and Kyoto, as I will be covering these two places on coming 24th Nov to 8 Dec, however given that my mum would like to go Osaka first, do you think if I cover Osaka from 24th Nov to 1st Dec and Kyoto from 1st Dec to 8th Dec in Kyoto to see the Winter Foliage, do you think it would sense to arrange in this way ? heard a few of my friends told me I should cover Kyoto first ? Last week of November is usually the peak autumn foliage in major cities in Japan like Kyoto, Tokyo and Osaka. While the 1st week of December is already the tail end of autumn and start of winter. Snow is quite rare in Kansai area and I believe Kyoto and Osaka only get a few days of snow at the start of the year. I personally feel that autumn in Kyoto is better than in Osaka. So if I were in your place, I would stay in Kyoto during the last week of November then move on to Osaka during the 1st week of December. Hope this helps and enjoy your autumn trip with your mother! Hi Ms. Tiffy, your blog on where to stay in osaka has been helpful, i keep on reading it several times as it serves as a reference in choosing a hotel. We are considering to stay in Namba. I’m concern with our transportation during our arrival and departure as we will be travelling with two kids coupled with strollers and luggages, and i see that taking airport bus is the most convenient for us. May I ask which hotel in Namba would provide us convenient access to airport bus stop without taking a cab? A certain Hotel Monterey Grasmere is located beside Jr Namba Station, however, said hotel is not included in your list, hence i’m not inclined in considering it. Thank you very much for your kind words! Apart from Hotel Monterey Grasmere Osaka which is located right beside Namba OCAT, Hotel Nikko Osaka is one of the airport bus stop in Namba from Kansai Airport. However, the frequency of KIX to Hotel Nikko Osaka is rather few – like only twice a day. While I have not personally stayed at Hotel Monterey Grasmere Osaka, I have previously stayed at their Kyoto branch and can say that Monterey is a good chain of business hotels in Japan. The decor is generally European boutique style. Their 23 sqm twin rooms are spacious for Japanese standards and the beds are wide enough to sleep one adult and one small toddler. In terms of location of Hotel Monterey Grasmere Osaka, even it is not located in the happening side of Namba, you can take the underground “Namba walk” and reach the Dotonbori area in about 7-15 minutes depending where you are going. So location wise, while it may not be as convenient as the hotels immediately around Dotonbori/Shinsaibashi or Namba Midosuji line for shops and eateries, I think it is in an acceptable area. More so if you have kids and luggages in tow as you can access the hotel from the airport via bus without taking a cab. Some of the online reviews say that front desk service is not that consistent, but if you manage your expectations well and won’t require exception handling (i.e. early check-in / late check-out, etc), then I guess you should be fine. Actually, I’ve just returned from Namba a few days ago and I stayed at Nono Namba hotel which I can highly recommend for families. The hotel is located on the other edge of Namba Walk just diagonally across Dotonbori and less than 5-minutes walk to Kuromon Market. It was a fairly short and cheap cab ride from Nankai Namba Station – I only paid JPY 680 (~ USD 7) since the flag down rate did not move at all. The hotel is fairly new, clean with wide beds as well. There’s also free ramen every night which everyone enjoyed. The communal dining place for ramen maybe quite noisy at night but almost all of the hotel guests seem to be very happy and excited. Grand parents, parents and children were in all wide smiles. There’s even a free public onsen in-house if you wish to try one. The only thing to note of is that you have to remove your shoes at the lobby and enter the hotel with your socks which I think is part of the fun. At the time I checked out, there were at least 10 strollers parked in the hotel’s storage beside the lobby. Somehow, the guests with small children managed to get there even if its not an airport bus stop nor immediately right beside Nankai Namba Station. In case you decide to stay in this hotel, I recommend you to book a superior room or deluxe room for more space. Overall, I think Hotel Grasmere Osaka is a good practical hotel to stay in and is extremely convenient for airport transfers via bus. 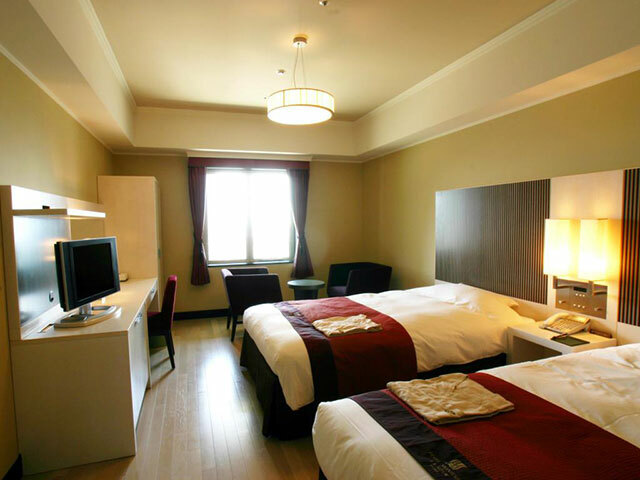 However, if you are looking for a more unique Japanese style experience with modern comforts, can fit all your things in one cab and willing to take one short cab from Nankai Namba Station, then you may wish to consider Nono Namba Hotel. I hope above information helps you decide! I wish you and your family a fun trip to Osaka! I just came across your website when booking my next trip to Osaka.I am so impressed with your dedication,details and valuable comments.What makes it so amazing is I have lived in Asia since 1986,Tokyo,Kyoto,Hong Kong and now Taiwan and before that traveling back & forth from NYC my birthplace.I thought I knew all the ropes guess I was wrong. I do have a question(having a dumb moment).I will take either the Airport Express or Limited Rapid Express from KIX to Namba Station since I am booked at The Cross Hotel which many friends both locals and tourists highly recommend as you have.They are located 320 meters from Osaka Namba Station which I assume is the Kintetsu Namba Line.So my question is how do I get from Namba Station to Osaka Namba Station? Is it a 15 minute walk underground as the maps I have looked at seem to be a connecting triangle of all Namba Stations or a walk on the streets of Osaka? Cross Hotel is definitely a great choice as it’s right smack in the middle of Shinsaibashi shopping district and Dotonbori food district! Namba Station is quite complicated comprising of “multiple” train/subway stations. I think the map below best illustrates the connection between these train/subway stations in Namba. Nankai Namba, where the Airport Express or Airport Limited Rapit will stop, is the yellow portion on the map. If you want to walk to Cross hotel via Midosuji avenue, then you take the north exit. It should take you about 10-15 minutes walk to Cross hotel from there. 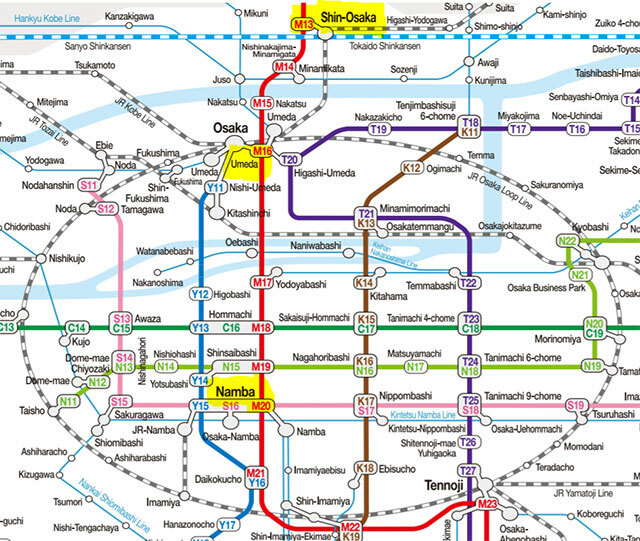 Yes, you are correct that Kintetsu Namba Line is in Osaka Namba Station, which is highlighted as orange on the map above. The underground Namba Walk covers Osaka Namba Station. In order to get there, you have to get to underground level from Nankai Namba (street level) and walk underground for about 10 minutes. I would suggest that you take Exit 15B elevator rather than Exit 14 if you have luggages with you. From Exit 15B Namba Hips, you have to walk further north and you should be able to see Cross hotel a few minutes walk away from the Dotonbori canal. The challenge in navigating Namba station is that the underground path to subways can be dense with people particularly during rush hours. This should be generally ok if you don’t have luggage with you but can be overwhelming to navigate if you have luggages in tow. If I were in your place and if budget is not an issue, I would take the north exit at Namba Nankai and take a short cab from there to Cross Hotel. Taxi cost should be around USD 10 to 15, but should save you a lot of time and save you from stress. Hope this helps Robert. I’m sure you’ll have a fun and very memorable trip to Osaka! I’m pleased with your website… very informative, and well-written at that! My family of four will be traveling to Osaka, tokyo, and kyoto on the last week of october to the 1st week of november. I’m just starting to do a research on these areas… i’m glad i saw your site! More power and… keep on writing! Thank you very much Gi for your kind words. I’m very happy that you found my blog helpful for your family’s Japan trip this October! Last week of October to 1st week of November should be a pleasant time to be in Osaka, Kyoto and Tokyo. Not too warm, not too cold and not too crowded. I’m sure your family will very much enjoy Japan this time of the year! Please feel free to browse through my other blog post and I’ll be more than happy to answer in case you have any questions. Cheers and happy travel planning! Thank you for your kind words. From Kyoto to Higobashi Station in Osaka, you can refer to this google map direction. Looks like it is easy. Assuming that you will be coming from Kyoto downtown, you just take the Keihan main line from Sanjo Station or Gion-Shijo which goes all the way to Yodoyabashi in Osaka. From Yodoyabashi Station, it will take less than 10 minutes walk to get to Higobashi Station or you can take a short cab ride with you if you wish to. The Keihan main train line is one of my favorite ways to get from Kyoto to Osaka and vice versa. It’s less crowded than other non-reserved train lines plying Osaka-Kyoto based on my personal experience. Hope this helps and enjoy your upcoming trip!